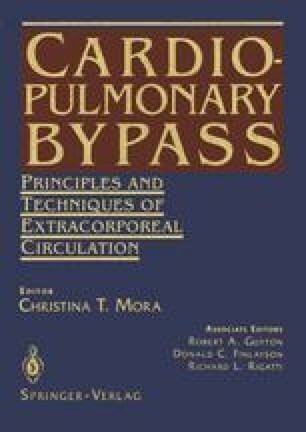 The pathophysiology of cardiopulmonary bypass (CPB), as described in the preceding chapters, includes hemodilution (both red cells and plasma proteins), fluid accumulation, hypothermia, and the response of blood components to artificial surfaces. Superimposed on these processes are the mechanical complications inherent in cardiac surgery, and the consequences of inadequate organ perfusion secondary to myocardial failure in the perioperative period. Particularly in the respiratory system, it is often difficult to ascribe changes in function to any one of these aspects of the procedure. This section of the chapter delineates the effects of cardiac surgery and CPB on the individual components of the respiratory system. Additionally, the “postperfusion lung” and possible causes for this syndrome are described and potential prophylactic therapies discussed.